Everyone who has ever attempted to lose weight probably started their journey with a quick Google search on the subject. In a matter of seconds, you can access seemingly unlimited pieces of advice, all promising to offer you the perfect fat loss solution. Step two of the journey then involves hopelessly trying to implicate each of these tips into your daily life, while bemoaning your own inability to stick with the program. However, let’s get real for a second: most of the online advice is a load of rubbish. More and more women adapt torturous diets, but stringent restrictions actually do very little to keep us healthy and happy. This makes sense, no? We all know people who have gone through an intense diet with initial success, only to see those results reversed later on. However, some online diets are quite effective; the trick is determining which information is helpful and which is not. 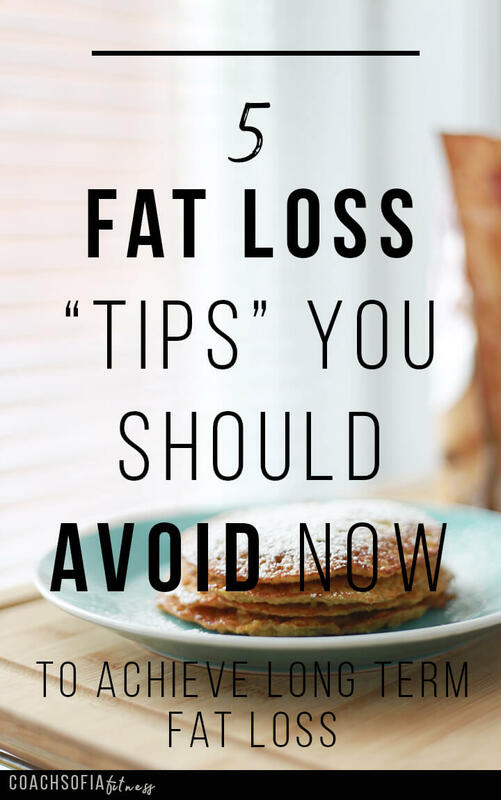 To help you out, here are some fat loss tips commonly promoted that you should avoid at all costs. A personal confession: I use to pick weight-loss programs based on the amount of ‘cheat’ periods, opting for diets that allowed you to binge when you were on holiday or gave you one day off each month. However, sustainable fat loss comes from a complete change in mindset and lifestyle. The concept of ‘cheating’ frames healthy eating as an obligation or something from which you want to escape. If you stay focused on these “cheat” periods, you might find yourself overdoing it. It’s like a free-for-all where you totally disconnect from all you’ve been working towards. If this happens, you can really start to feel bad about yourself, initiating a vicious cycle of cheating and regret that will really hurt your relationship with food and make adopting a healthy lifestyle that much harder. We know by now that cutting out certain foods is good for nothing more than yo-yo dieting and guilt. One of the biggest factors for chronic dieters is that we’re emotional eaters. We enjoy the smooth embrace of chocolate after a hard day or a hearty lunch with friends. Denying ourselves these luxuries is only going to further damage our relationship to food. Health is a balance of the emotional and physical. Nobody’s willpower is infinite, and beating yourself up does nothing for motivation. Learning to have a healthier relationship with food means regulating these cravings, so instead of restricting specific foods, aim for a moderation of treats and a focus on not over-eating. It’s a given that weighing yourself is a part of fat loss. However, many dieters often take this process to the extreme. Weighing yourself several times a week, or even daily, is never a good idea. Our bodies fluctuate so much it won’t give you an accurate impression and will likely de-motivate you in the process. No one wants to be confronted every day with minimal losses and occasional gains. I now weigh myself once a month, but you can stretch it even further. You will naturally see and feel your improving health anyway. It’s much more empowering to notice you no longer get out of breath while walking upstairs or discover you can fit into your ‘skinny jeans’ again. You don’t need to meticulously watch the numbers on the scale trickle down to see these improvements. Oh, Fitspo…This is the internet version of flipping through glossy magazines and looking at pictures of women who look nothing like you. The worrying trend of ‘Fitspo’ or ‘fitspiration’ involves collecting pictures of your ideal body to motivate yourself. There are endless social media accounts producing Fitspo content, and concerns have already been raised about the effect it has on eating disorders in young people. If you think you would benefit from picture motivation, try inspirational quote shots instead. Alternatively, you can use your own progression photos! Instead of dwelling on how far you have left to go, celebrate the distance you have already come. Food is so much more than just an intake of calories. All of the vitamins, minerals and nutrients available in our food are essential for a properly functioning body. fat loss happens when your body is working at optimal capacity. This means you need to get all the right stuff to see the pounds fall off. Many dieters fall into the habit of consuming processed weight-loss snacks since they are often low in calories. However, this usually means sacrificing nutritional content. A hearty meal with protein, carbs and tons of vegetables will always be healthier than a power bar – even if it does have more calories. Remember: fat loss is about achieving holistic health, not finding short cuts. Luckily, there are lots of tools out there to help you learn more about the food you are eating. For example, Fooducate allows you to scan a barcode or search for a food and it tells you all the nutritional information of that product. You can use this to find out which of your favorite foods are healthy and which are not so that you can be sure you’re getting the best. If you use apps like this, though, consider using a secure network since they require personal information and often link to location services to help you find healthy food nearby. So, as your quest for healthy living and fat loss continues, remember how some information out there is misleading. You want to find things relevant to your lifestyle and that work for you. Forcing yourself to do everything people say will damage your morale and self-esteem. Avoid the tips on this list and stick to what feels right. Have you ever tried any of these tips? What was your experience? What advice can you offer to someone looking to lose weight? Let us know in the comments section below.